An FCA regulated broker, FXGiants presents a $35 No Deposit Bonus to all its newly registered clients (first-timers only) upon account verification starting on November 1 and ending on December 31, 2018. The clients are required to open a live trading account (zero fixed spread, vantage, mirror or privilege account excluding STP/ECN accounts) to apply for this bonus. The funds will be subject to withdrawal after completing four turn lots. Any withdrawal request before reaching the necessary number of lots will result in the cancellation of the bonus. For example, a client trades three lots and makes $21 profit, in this case, the withdrawal request will annul the bonus. Please note that the bonus amount is for trading purposes only and, therefor, not withdrawable. 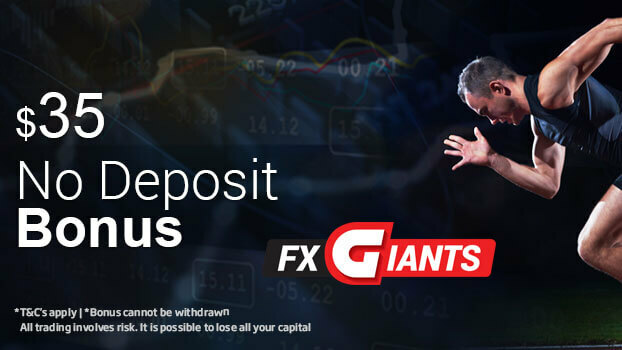 Just follow these simple steps to receive the bonus: you have to register for a live trading account on www.FXGiants.co.uk, send a request for the bonus through your personal cabinet, verify a valid phone number by receiving a message, and provide the necessary documents for account verification to be eligible for the bonus. After verifying the required info, the bonus will be transferred to your live account automatically. This promotion is offered only once per client. The clients are prohibited from accumulating profits produced via different bonuses. The traders are not allowed to use EAs or other plugin systems. In the event of SMS verification failure, other verification steps are to be followed.